The third volume of The Art of the Koto, which features the artistry of Nanae Yoshimura, takes us into the second half of the twentieth century. It comprises five works written between 1969 and 1989 for the nijugen, a version of the koto with 21 rather than the traditional thirteen strings. This instrument was developed through co-operation between the composer Minoru Miki and the virtuoso koto performer Keiko Nosaka in 1969. The koto belongs to the family of long zithers, and as with many other Japanese instruments, it can be traced back to the Asian mainland. Its history in Japan spans more than twelve centuries. The slightly convex body of the instrument is a hollow shell made of kiri, or princess tree, and its strings are traditionally made of silk, although nylon strings are now in common use. The first three pieces are famous and well-known examples of what may be seen as the first generation of pieces for the instrument. The first piece, Miki’s Tennyo, gains this place of honour by virtue of the fact that is was the first ever composed for the instrument. The second piece, as set of five sketches named after traditional colours, was written in 1973 by Katsutoshi Nagasawa. Their warm and approachable melodies have contributed much to developing a fan base for the instrument, while the comparative simplicity of the techniques required to play them means that most nijugen players study them as part of the learning process. Miki’s Aki-no-kyoku (Autumn Fantasy) of 1980 was chosen for its fresh approach toward melody for the nijugen and shakuhachi, and its exploration of the limits of virtuosity on the former. The two pieces that end the disc are works from the late 1980s, commissioned for performance at her recitals. Nanae, by Akira Nishimura, freely explores the historical roots of the flat zither, outside the restraints of the Japanese koto tradition. Kamu-Ogi-Guoto, by Somei Sato, travels back to the ancient world of Japan’s mythological age, when the koto was used as a medium of communication with the gods. It was written with the sincere wish that the ancient gods would deign to dwell in this modern incarnation of this instrument. Her recent concert performance in Rome, Italy, with Kifu Mitsuhashi, was enthusiastically compared to Tony Scott’s Music For Zen Meditation, the seminal recording credited with starting interest in new age music. Booklet annotation is provided by Associate Professor Steven G. Nelson, the only Western member of staff at the Research Centre for Japanese Traditional Music, Kyoto City University of Arts, Kyoto, Japan. Nanae Yoshimura was born in Tokyo and began to study the koto from the age of three, receiving her teaching license with the Matsu-no-mi Kai of Ikuta–school koto performance at the age of sixteen. She studied the classical repertoire for koto and jiuta shamisen with Soju Nosaka of the Kyushu lineage, and contemporary works for koto and nijugen (21-stringed koto) with Nosaka's daughter, Keiko Nosaka. She has been especially active as a specialist on the latter instrument since the early 1970s, always in search of new possibilities for musical expression and extending the horizons of the instrument. Born in Tokyo in 1950, Kifu Mitsuhashi studied Kinko-school shakuhachi with Sofu Sasaki and the classical honkyoku repertoire of the Fuke school with Chikugai Okamoto. He is the recipient of numerous awards in Japan, holds the qualification of shihan (master) in the Kinko school, and runs his own group for shakuhachi performance, the Kifu Kai. 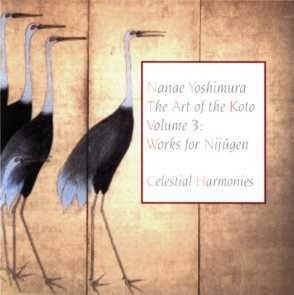 He has recorded the 3-CD series The Art of the Shakuhachi Celestial Harmonies. Nishikigi ni yosete (Nagasawa) 13'58"